RegeneRx Biopharmaceuticals Inc (OTCMKTS:RGRX) surges on milestones and recent developments of buy recommendation, joint venture, and enrollment for dry eyes. The stock price has been consolidating over the last year, and broke out of its base on high volume and skyrocketing share price sending shares over 50% from its base. The stock has been exceeding its daily average volume for several consecutive days now. 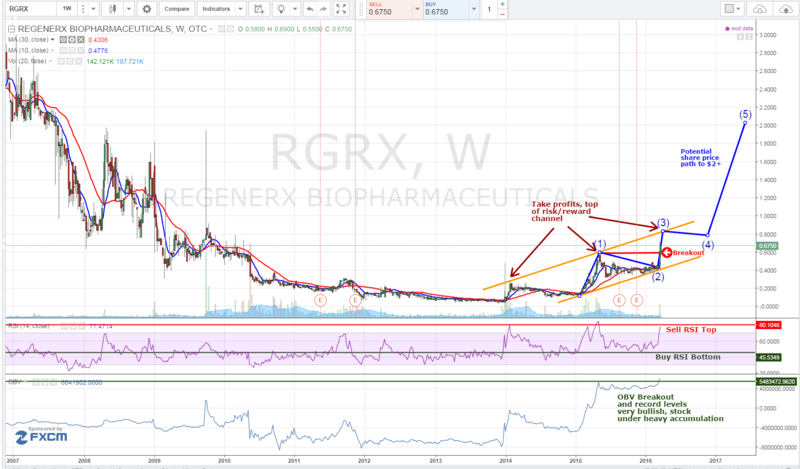 RGRX appears to be set for more gains and could eventually reach a price target of $2.10+. This mean the stock is poised to almost triple from current levels. RGRX is ready for a breakout year after being stuck in consolidation mode for almost a year. In recent developments, the company announced that its TB4 drug had shown to improve and promote regeneration and repair of damaged central nervous system cells. This has a huge market with several million people diagnosed with dry eyes. There are several future catalysts that can push this stock forward. MicroCap Spot has featured this company in a prior post and the stock continues to post significant gains. Volume has seen a large expansion but has not reach the 1 million share trading volume club. RGRX has been making advancements with its Joint Venture for its severe dry eye trial. It announced that its phase 2 trial had met its key objectives and data showed the drug demonstrated statistically significant improvement in corneal damage and eye discomfort. Impressively, improvements were seen within 28 days after the completion of treatment. The trial of phase 2/3 sponsored by a different LLC is not targeting severe dry eye like this drug treatment. Regarding developments on ReGreenTree joint venture which is between RGRX and G-treeBNT. G-treeBNT is a biotech venture in South Korea. The two companies are engaging in the development of its RGN-259 drug. G-treeBNT holds a significant, majority stake in RGRX and is funding and conducting the clinical trials and product development which is huge support and financial lift for the company. The joint venture has launched a new website to provide updates to investors. In addition, the joint venture is in the process of not one but two phase 3 clinical trials in the USA. RGRX incorporated on May 13, 1982, is a biopharmaceutical company. Its strategy is focused on the development of a therapeutic peptide, Thymosin beta 4 (Tß4) for tissue and organ protection, repair and regeneration. It has formulated Tß4 into three product candidates in clinical development, which include RGN-259, a preservative-free topical eye drop for regeneration of corneal tissues damaged by injury, disease or other pathology; RGN-352, an injectable formulation to treat cardiovascular diseases, central and peripheral nervous system diseases, and other medical indications that may be treated by systemic administration and RGN-137, a topical gel for dermal wounds and reduction of scar tissue. We will be updating on RGRX when more details emerge so make sure you are subscribed to Microcapspot so you know what’s going on with RGRX. Disclosure: we hold no position in RGRX either long or short at the publication of this article and we have not been compensated for this article.